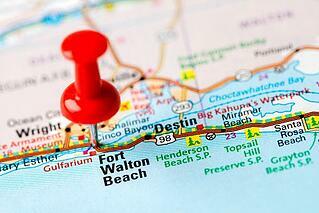 A few miles west of Destin is Ft. Walton Beach, an unforgettable Florida getaway spot. This coastal locale is a top pick for anyone who wants to enjoy warm weather, plenty of sunshine, and unending outdoor recreation. From water parks to water access, Ft. Walton Beach has something for everyone. These five suggestions are surefire ways to have the time of your life on your next trip to Ft. Walton Beach, Florida. One of the top attractions in the area is the Gulfarium Marine Adventure Park. If you love marine animals, then you won't want to miss this amazing destination. In the Shallows Exhibits, you can see tiny hermit crabs as well as enormous California sea lions. At the Dolphin Pavilion, you can watch an unforgettable show where you see just how amazing and talented dolphins can be. The Gulfarium Marine Adventure Park is a clear winner for kids as well as adults. Visitors of all ages can appreciate the chance to see sharks, otters, and penguins up close. Skilled trainers have great relationships with the animals, making the shows heartfelt as well as spectacular. Fudpucker's is a true institution in Florida. Fudpucker's Beachside Bar and Grill on Okaloosa Island is just minutes from Ft. Walton Beach, but a lot closer than the Destin location. That means it’s easier than ever to dig into the famed Fudpucker's menu, which contains delicious items like hot crab dip, coconut shrimp, or grilled ribeye steaks. That's all in addition to their creative cocktail list! The food is noteworthy, but Fudpucker's steps it up a notch by offering entertainment. You can feed alligators during the day, or you can check out the dinner theater by night. The Magic Dinner Theater is a 60-minute delight that combines fantastic cuisine with exceptional comedy and plenty of illusion. If you're excited to see a more natural, pristine and scenic side to Ft. Walton Beach, then it may be worth a short drive to the Timpoochee Trail. The trail runs along the coast for a staggering 19 miles, and the whole way is paved and suitable for walkers, joggers, or even cyclists. The Timpoochee Trail is named for a chief of the Euchee Indians named Timpoochee Kinnard. The trail itself winds through several seaside resorts and communities, and it provides the perfect opportunity to spot everything from wildflowers to ocean views to migrating birds. To make a serious splash during your time in Ft. Walton Beach, why not charter a double decker pontoon boat? This is an opportunity that anyone can enjoy, and you don't need to be a boat captain to control your own vessel. Double decker pontoon boats can be picked up right from Adventure Marina. In your chartered pontoon boat, you can head into the Santa Rosa Sound for access to a number of beautiful islands. You could also head in the other direction, toward Destin, to hang out near Crab Island and enjoy a thrill on your very own double-decker water-powered slide! Pirates are a recurring theme in the Ft. Walton Beach area. Whatever the season, you can find pirate-themed restaurants, playgrounds, and even mini golf parks. Once a year, the pirate aesthetic takes over thanks to the Billy Bowlegs Festival. If you're in town, be sure to participate. The fun includes live pirate skirmishes, a parade, grog and grub from local bars and eateries, live music, and plenty of activities for the kids. If a double decker pontoon boat charter is on your itinerary, be sure to check out Double Fun Watersports. We're thrilled to offer double-decker pontoon boats that will round out your trip and guarantee fantastic memories for the whole family.